This blog was following the book of Genesis and the Gospel of Mark in tandem, but completed the latter some days ago. It continues with Genesis alone meantime. I have been urged to “get a move on” with these chapters of Genesis, and although I think they deserve as much consideration as any other part of the bible, have compromised by using an easily downloadable translation, the Complete Jewish Bible, which readers will find below in a large two-chapter chunk. As always the daily news headline is a reminder of the world we live in. 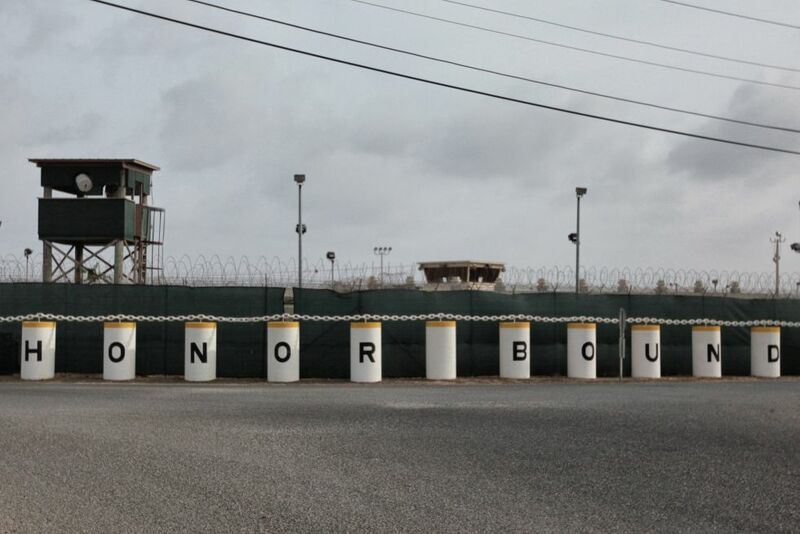 WILL GUANTANAMO OUTLIVE OBAMA’S PRESIDENCY? 11 Their father Isra’el answered them, “If that’s how it is, do this: take in your containers some of the land’s best products, and bring the man a gift — some healing resin, a little honey, aromatic gum, opium, pistachio nuts and almonds.12 Take twice the amount of money with you; and return the money that came back with you in your packs — it could have been an oversight. 13 Yes, and take your brother too; and get ready; and go again to the man. 14 May El Shaddai give you favour in the man’s sight, so that he will release to you your other brother as well as Binyamin. As for me, if I must lose my children, lose them I will.” 15 The men took that gift, and they took twice the money with them, and Binyamin; then they prepared, went down to Egypt and stood before Yosef. 16 When Yosef saw Binyamin with them, he said to his household manager, “Take the men inside the house, kill the animals and prepare the meat. These men will dine with me at noon.” 17 The man did as Yosef ordered and brought the men into Yosef’s house. 18 Upon being ushered inside Yosef’s house, the men became fearful. 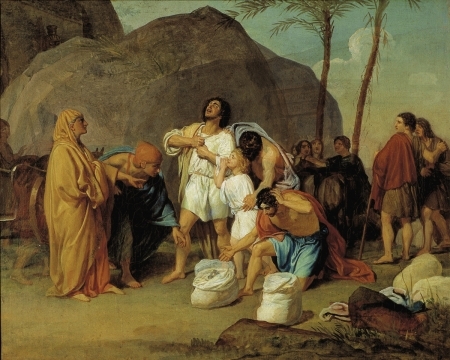 They said, “It’s because of the money that was returned in our packs the first time that we have been brought inside — so that he can use it as an excuse to attack us, take us as slaves and seize our donkeys too.” 19 So they approached the manager of Yosef’s household and spoke to him at the entrance of the house:20 “Please, my lord, the first time we indeed came down to buy food; 21 but when we got to camp, we opened our packs, and there inside our packs was each man’s money, the full amount. We have brought it back with us;22 moreover, we have brought down other money to buy food. We have no idea who put our money in our packs.” 23 “Stop worrying,” he replied, “don’t be afraid. Your God and the God of your father put treasure in your packs. 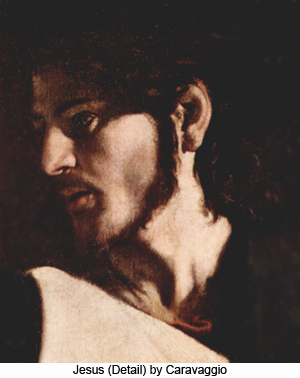 As for your money — I was the one who received it.” Then he brought Shim‘on out to them. 30 Then Yosef hurried out, because his feelings toward his brother were so strong that he wanted to cry; he went into his bedroom and there he wept.31 Then he washed his face and came out, but he controlled himself as he gave the order to serve the meal. 32 They served him by himself, the brothers by themselves, and the Egyptians included at the meal by themselves — Egyptians don’t eat with Hebrews, because that is abhorrent to them. 33 So they sat there facing him, the firstborn in the place of honor, the youngest in last place; and the men expressed their amazement to each other. 34 Each was given his serving there in front of him, but Binyamin’s portion was five times as large as any of theirs. So they drank and enjoyed themselves with him. 44 Then he ordered the manager of his household, “Fill the men’s packs with food, as much as they can carry, and put each man’s money just inside his pack. 2 And put my goblet, the silver one, just inside the pack of the youngest, along with his grain money.” He did what Yosef told him to do. 3 At daybreak the men were sent off with their donkeys; 4 but before they were far from the city Yosef said to his manager, “Up, go after the men; and when you overtake them, say to them, ‘Why have you repaid good with evil? 5 Isn’t this the goblet my lord drinks from, indeed the one he uses for divination? What you have done is evil!’” 6 So he caught up with them and said these words to them. 7 They replied, “Why does my lord speak this way? Heaven forbid that we should do such a thing! 8 Why, the money we found inside our packs we brought back to you from the land of Kena‘an! So how would we steal silver or gold from your lord’s house? 9 Whichever one of us the goblet is found with, let him be put to death — and the rest of us will be my lord’s slaves!” 10 He replied, “Fine; let it be as you have said: whichever one it is found with will be my slave. But the rest of you will be blameless.” 11 Then each hurried to put his pack down on the ground, and each one opened his pack. 12 He searched, starting with the oldest and ending with the youngest; and the goblet was found in the pack belonging to Binyamin. 13 At this, they tore their clothes from grief. Then each man loaded up his donkey and returned to the city. Yosef is playing tricks on his brothers in order to test their character. He selects Binyamin because he wants to see whether his older bothers have leaned to care for this younger brother better than they cared for him. Perhaps he doesn’t altogether realise the pain he is causing his aged father. Yaakov on the other hand, after taking refuge in his favouritism towards Binyamin, recovers his realism. Once he identifies “the man” in Egypt as the source of his pain, he begins to treat him as opponent, as someone akin to Lavan or Esau or God, with whom he has struggled in the past and earned his new name Isra’el, the fighter. He decides to help his sons play the strongest hand they can in a bad situation. They are to bear gifts, so that they appear before Yosef as people of substance rather than as beggars. The storyteller plays on the notion of Yosef as somehow equivalent to God. His manager jokes with the brothers that their God has put their payments back in the sacks, but of course it was Yosef who did so. Yosef asks that God will be good to Binyamin but the audience knows that it is in his power to be good to him. And it is with God-like cunning that Yosef arranges his final test, which designed to see if under pressure the brothers will abandon Binyamin. 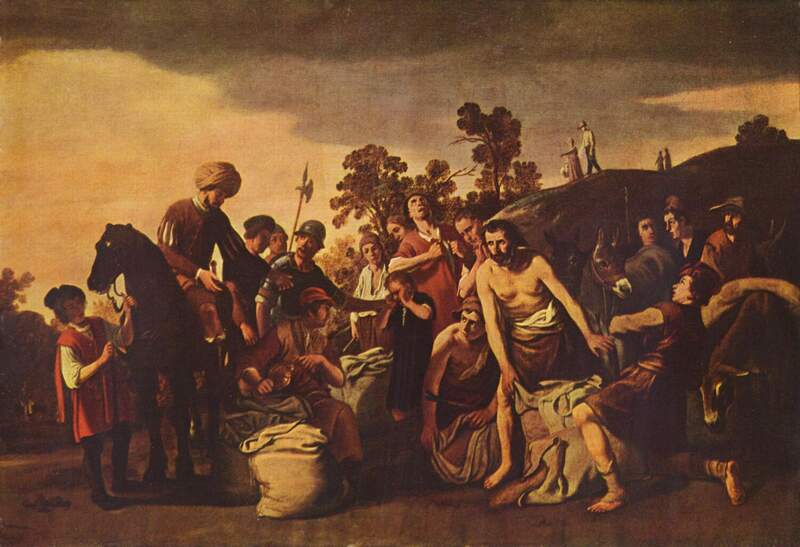 In the crisis it Y’hudah, who was humbled and had to learn justice from his daughter-in-law Tamar (Genesis 38), who now intervenes and offers to be a slave to Yosef to save his younger brother from slavery and his father from further grief. The storyteller gives him a noble speech, which shows he has realised the wrong done to Yosef and his duty as the eldest brother.